How is meaning conveyed through aesthetic choices in horimono? Much like a writer uses syntax, diction, and rhetorical appeals to captivate his audience, the tattoo artist must make aesthetic choices to maximize the appeal or artistic value of his work. The following visual analyses of oni tattoos investigate the techniques and motifs tattooists use to make their art visually effective. This tattoo (to the left) an especially striking example of horimono. Several common aesthetic techniques are used in the tattoo. Size -- The most salient feature of this tattoo is its large size. The "body-suit" style tattoo is a very traditional Japanese style known as horimono. Although not visible in this picture, the horimono usually cover the front of the body as well, down to the bottom of the thighs. More than any other style of tattoo, horimono make a statement about the dedication of the tattooed individual to the art of hormone and traditional Japanese culture. In fact, because most horimono are inked totally by hand (without using tattoo machines), and so the process of getting a horimono is more involved and painful than getting a modern western tattoo. Typically, a horimono is outlined by hand without using a stencil. The tattoo artist first tattoos the outline of the piece, and then subsequent tattooing sessions are required to fill the outline with colors. Customers may have weekly tattooing sessions for up to a year to complete their horimono. Due to the highly personalized and time consuming nature of tattooing, horimono are also incredibly expensive-- often costing upwards of $20,000 USD for the complete tattoo. The high cost and long time it takes to get a horimono ensures that the subject be completely dedicated to the art. Motifs -- The tattoo is composed of several traditional and symbolic motifs. Sakura flowers are a staple of traditional Japanese art, and especially of ukiyo-e, a famous style of woodblock paintings that were popularized during the Edo period (1603-1867) in Japan. Because horimono is more strongly influenced by ukiyo-e than any other Japanese art, the sakura flower motif is found in many tattoos. Because of its intense beauty, fragility, and short bloom period, the sakura are often symbolic of life itself. The commonly appear in the background of oni and dragon tattoos. Dragons represent wisdom and strength. The dragon is the most popular motif in horimono because of their visual appeal and positive connotations. Unlike in western mythology, the dragons of Japanese lore are mostly benevolent, wise, and extremely ancient. Dragons also symbolize strength courage, and were thought to have many supernatural powers. *It is worth noting that in Japan, tattoos have a negative social stigma among the general public due to perceived associated with the yakuza gang. Some owners of horimono must conceal their body art to be acceptable in the workplace and society. This tattoo by well-known American artist Chris Garver melds traditional aspects of horimono with modern styling. In the graphic, the face of a beautiful woman is shown transforming into a hannya mask. The hannya mask is closely related to the oni mask in Japanese Noh theater. The hannya represents a woman who has transformed into an evil demon as a result of extreme jealousy or obsession. In this way, it is similar to oni found in one notable story from the Konjaku monogatarishū (See "Oni Lore" tab) and in other texts. The deliberate portrayal of the woman in metamorphosis makes a deeper statement; it's a reminder that there is more overlap between human and oni nature than is apparent from physical appearances. 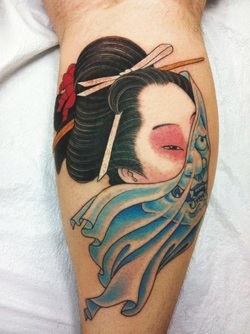 The visual style of this tattoo is clearly more modern than traditional horimono. The tattoo deviates from traditional stylings in its overtly metaphorical composition, more natural colors, and more subdued feautures. Furthermore, the tattoo was done using a tattoo machine, which is not usually used in horimono. This particular oni tattoo shows an interesting departure from traditional style. While the vibrant colors, mask styling, and smoke background are typical for a traditional oni mask tattoo, this tattoo has several unusual features. Firstly, the oni mask is lacking horns, which is quite unusual. The lack of horns makes the mask appear more human. There are two protruding bumps where the horns of the oni are supposed to be. This is design choice is open to multiple interpretations. It’s possible that the tattoo artist wanted to portray an oni in a transition state between human and ogre. The eyebrows, facial hair, and beard also support this interpretation, as they are human characteristics not typically depicted in oni masks. Also, the elongated earlobes of this oni are unusual. The earlobes might reflect cross-cultural styling, or they may simply be an aesthetic choice based upon the increasingly popular body modification technique of stretching one’s earlobes. This tattoo is almost certainly done by modern methods as opposed to the traditional horimono practice. The blend of traditional and new styling shows that the oni design is quite flexible. In modern times, oni portrayals are becoming increasingly diverse and open to interpretation. This tattoo juxtaposes the oni and koi fish motifs quite strikingly. The oni and koi have seemingly contradictory connotations. In Japan, the koi represents good fortune, strength, and perseverance. This is because the of the koi’s behavior in the wild; much like the salmon of North America, the koi can often be observed swimming upstream, against the current. The Japanese therefore view the koi as a hardworking and perseverant animal. In fact, one popular legend says that if a koi fish swims all the way up a river and then up the last waterfall, it will be rewarded by transforming into a dragon, the most powerful and wise beast in all of Japanese mythology. Recall, however, that oni can also be born of a kind of perseverance—obsession. In oni story, a monk was so determined to get his revenge on the emperor that he starved himself to death and transformed into a terrible oni. So, the juxtaposition of the koi and oni in this tattoo could be a way of presenting “two sides of the same coin,” so to speak.